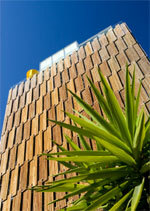 Council House 2 (CH2) is claimed to be Australia’s greenest and healthiest office building. It opened in Melbourne in August 2006 and has set a new world standard benchmark for design and construction of future high-rise buildings. 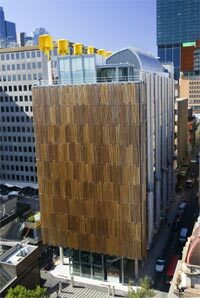 The building is described as visionary with potential to change the way Australia and the world approaches ecologically sustainable design and construction. The Green Building Council of Australia has awarded the building six Green Stars which represents world leadership in office building design. The Green Star rating system separately evaluates the environmental design and performance of Australian buildings based on a number of criteria, including energy and water efficiency, quality of indoor environments and resource conservation. The building design cuts C02 emissions by 87%, electricity usage by 82%, gas usage by 87% and water usage by 72%. CH2‘s north façade comprises 10 dark coloured air extraction ducts that absorb heat from the sun, helping stale air inside rise up and out of the building. Occupants can control the fresh air flow to their work spaces by floor vents. About 100,000 litres of black (toilet) water a day is extracted from the sewer in Little Collins Street. The sewage (which is 95% water), along with any generated on site, is put through a multi-water treatment plant that will filter out water and send solids back to the sewer. The extracted water is treated through a micro-filtration system to create A-grade clean water suitable for all non-drinking uses. Some of the recovered water supplies CH2’s water cooling, plant watering and toilet flushing needs. The rest is used in other council buildings, city fountains and plants. More water will be saved through recycling water from the fire-safety sprinkler system and from rainwater.